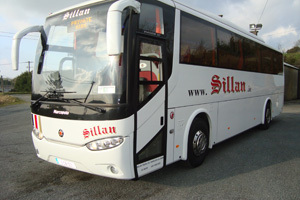 Sillan Tours is a family business providing a commuter service from Cootehill to Dublin daily for over 40 years. We also offer coach hire services for bus tours, private hire, airport transfers and school tours. Sillan Tours have assembled a team of local, hand picked, highly skilled drivers to ensure that our top priority remains a punctual, courteous and helpful service, hail, rain or snow. We are continually trying to improve our service and appreciate any feedback customers have.